I feel this story might have slipped under the radar. The guy who designed the Big O has a counter-proposal to the Fed’s Champlain Bridge Redux project. Noted 88 year-old French architect Roger Taillibert says his design looks better, is better designed, will cost less and can be completed in less time than what’s currently being planned. The Tory plan is estimated to cost anywhere between 3 and 5 billion dollars and is currently slated to open at the end of 2018 (fifty months from now). Taillibert says his plan would cost $1.7 billion and can be completed in 39 months. Main difference: use of pre-fabricated steel supporting structures in lieu of the seventy or so concrete columns currently featured in Poul Ove Jensen’s design. Now before I get going, an issue to address. Taillibert designed the Olympic Stadium, the Olympic Village and a variety of other structures at the Olympic Park, including the pool and the velodrome, which today houses the Biodome. All the problems related to the Big O are principally issues relating to its construction, not its design. The substitution of building materials by crooked contractors and the numerous delays had nothing to do with the architect, and everything to do with the construction companies, several of which were run by individuals who had political connections to former mayor Jean Drapeau. So before anyone jumps up on the soapbox to unilaterally dismiss anything proposed by Taillibert, remember that his designs aren’t the problem, it’s how they were built and by whom (and what corners the builders cut). Also worth noting: all the buildings he designed here are still in use, and that’s significant in and of itself. Most Olympic structures end up slowly rotting away as they seldom have any post-game use. We’re lucky because we’ve gotten 40 years of service from our Olympic installations. Taillibert has additional criticisms to volley at the appointed Danish architect (remember – there was no design competition); namely that the proposal is aesthetically lacking while being needlessly complex – in sum it seems over designed. He points to the concrete pylons and the use of three physically separated roadways instead of a suspension bridge design supporting a single large roadway. Taillibert’s design conforms to the Fed’s requirement that the bridge support at least six vehicular traffic lanes and two lanes for public transit (with the eventual implementation of light rail), but does so in a more straightforward (and in my opinion practical) fashion. For a comparison of the two designs, side by side, check this out. What makes Taillibert’s design intriguing is that, for an architect so closely associated with the use of concrete, his proposal instead uses steel, which he considers superior to concrete in terms of long-term survivability. In essence, he describes his design as being both practical, with an eye to minimizing maintenance, and more worthy of Montreal and the bridge’s namesake – the multiple suspension towers and their cables more evocative of the ship Champlain sailed on. Consider that the current Champlain Bridge was built with steel-reinforced concrete which eroded due to road salt and a lack of vehicular deck drainage system; over the years corrosive slurry infiltrated the concrete and ate away at the steel cables within. 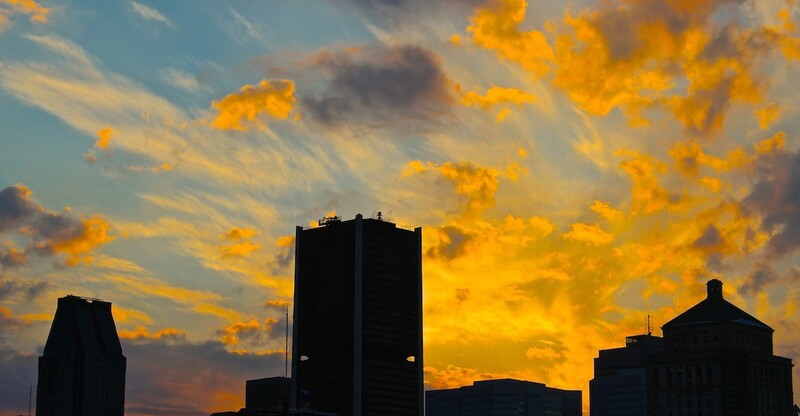 The response to Taillibert’s proposal have ranged from outright refusal on the part of the federal infrastructure ministry to scepticism from Montreal Mayor Denis Coderre. The Fed’s position is that the bridge project is already moving along, that they’re sticking with the architects they’ve already chosen and are about to announce which of three consortia will actually build the bridge. Here’s where things get interesting: both SNC-Lavalin and Dessau are bidding to build the bridge, and both these firms are either currently or have recently been investigated for corrupt practices. It should be noted that the winning consortium is “expected to operate the structures (meaning the new bridge and some of its connected roadways, including the federal portion of Highway 15) for thirty years”. I’m not well-versed in legalese, but I would assume this means that the winning firm will get the maintenance contract, locked-in, for whatever bridge they end up building (and yes I checked the preliminary report – that’s precisely what it means). The Fed also states that the winning consortium will have some leeway in terms of the final design and the materials to be used. The concrete used for the original bridge was supposed to have been a ‘technologically innovative’ type of concrete that ultimately failed. I don’t how comfortable I am knowing the winning consortia would be encouraged to take risks to maximize profitability. Isn’t this the whole problem with construction of government projects in this province in the first place? Perhaps Mayor Coderre has a point about Roger Taillibert – why didn’t he make his proposal sooner? The lack of a formal design competition, for one. Provencher Roy and Poul Ove Jensen were selected and it’s not entirely clear how the Fed came to make its choice. Mr. Jensen principally designs bridges, and has some 200 designs to his name. Provencher Roy is a well-known architectural firm based in Montreal with a long list of various projects, including a lot of institutional spaces and rehabilitated spaces (such as the new Canadian arts pavilion at the Montreal Museum of Fine Arts, the Montreal World Trade Centre and the renovation of the Ritz-Carlton Hotel). Though these are logical choices, an open design competition never occurred, and therefore the proposed bridge seems like it’s little more than a rendering based on the preliminary study, albeit with one major defect. Clearly Mr. Taillibert did his homework. One of the more curious points he brought up in the interview he did with Radio-Canada is that because his design features fewer (far fewer) support columns, which he says would lessen the environmental impact. Initially I thought this was little more than mere greenwashing – it’s always a good idea to tout the ecological merit of your project, regardless of how dubious those claims may be, simply because people like hearing ‘green’ buzzwords. Frankly, it’s usually about as far as we go. But the preliminary proposal actually spends a great deal of time pointing out issues pertaining to environmental and cultural impact. I didn’t realize it, but there’s a Mohawk burial site located on Nun’s Island that needs to be considered separately, and a fair bit of text focuses on minimizing damage to the river’s underwater ecosystem. Fewer supporting columns means less disturbance to what lies beneath, so it makes the Fed’s choice to go with seventy supporting columns a bit of a head scratcher, especially given how much time was spent by the consultants focused on ensuring the new bridge design would do as little environmental damage as possible. I’ll close by saying this: this is the most important bridge in the entire country. It’s both the busiest crossing and the one pulling in the most revenue from cross border trade. It’s vital to the interests of Montrealers. And yet, despite this, the only kind of appeal to the public has come somewhat as a back-handed compliment. We were told by Denis Lebel that ‘maybe the bridge could be named after Maurice Richard’ in what I can only imagine was a Tory effort to make nice with Les Habitants and maybe score a few votes here in 2015. That said, the idea to name the bridge after Maurice Richard left many Montrealers and Quebecers wondering how anyone in Ottawa could possibly elevate a mere hockey player to be on a equal footing with the man who started the colony of New France, arguably setting the sequence that lead to our creation as a nation in motion. The Richard family said they were not at all in favour and then the issue was dropped. And then, as though to prove just how utterly useless the provincial government actually is, the PQ and CAQ managed to get the National Assembly to agree (without debate) that the new bridge should be named after Samuel de Champlain. An affirmation after the fact (it was decided yesterday). Provincial transport minister Robert Poeti made the point that the motion would be pointless given the bridge is under federal jurisdiction. Ultimately, they’ll also make the all, unilaterally, on naming the bridge. From what I’ve been told, if we’re really well behaved they might let us drive on it. More to come on this issue, doubtless. When the time comes to publicly eulogize Richard Bergeron (which I hope is a very long time from now), someone will remark how the Champlain Bridge LRT is his legacy. There may even be a call to have it named after him, or some such thing, as inappropriate and random as the decision to name the dilapidated old gazebo in Fletcher’s Field after Mordecai Richler. For an interesting perspective on the primary differences between light rail and trams, read this fascinating piece by Jarrett Walker. The basic difference is generally assumed to be whether or not the vehicle travels on a separate track or lane (in which case it would be called light rail) whereas a tram shares the road with regular traffic. I’ve always thought of trams as short and light rail as considerably longer too, but there’s a lot of overlap. Mr. Walker proposes considering stop spacing – the distance between regular stops – as a better differentiator. Think about the proposed Champlain Bridge LRT system the next time you’re out waiting in the cold and two or three jam-packed accordion buses fly past you on Cote-des-Neiges Boulevard. That or a similar number of equally packed Métro trains at any a growing number of stations. If an LRT system over the new bridge encourages more Brossardians to use public transit for their commuting purposes, great – this will help the new bridge last a little longer and may further serve, in addition to the ten lanes, to ease congestion and the subsequent concentration of vehicular emissions. But Montreal has its own public transit and pollution issues to deal with, dossiers we’ve neglected for far too long. Projet Montreal even proposed creating a sustainable transit fund, a trust of sorts, partially funded through STM general revenue and a tax on downtown parking (as well as other sources), designed specifically to fund the development and improvement of our public transit system. it astounded me to learn this wasn’t already the case. Is it amateur hour in this city or what? In any event, I highly doubt this means the Tories are going to help fund an LRT system, I figure at most they’ll include the cost of integrating an LRT track into the bridge, and leave building the vehicles, stations and the rest of the (presumed) system to the provincial government. And that’ll be Quebec’s contribution I suppose, assuming they go along with it in the end. I can’t imagine an LRT system will be delivered on the Tories’ expedited schedule. We’re treading dangerously close to repeating two fatal errors we’ve done, in separate instances mind you, in the recent past. 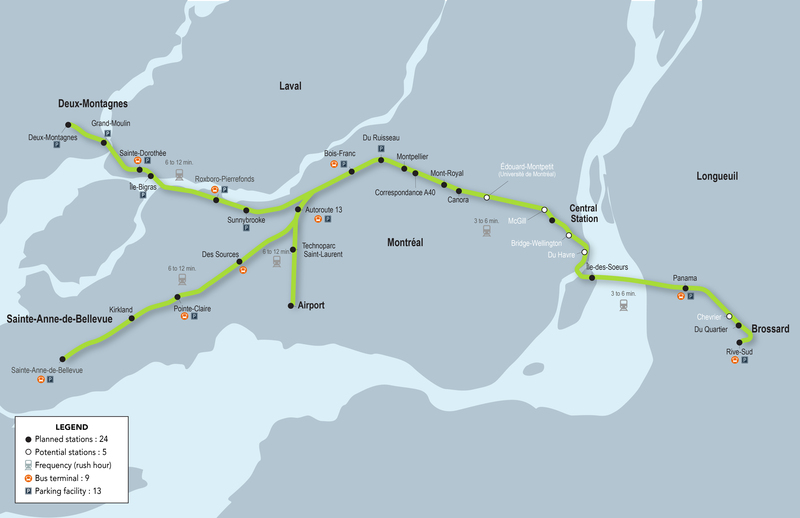 The province was supposed to contribute an LRT to the Mirabel project so that the airport could be connected to the city. Never happened. There’s not much out there about a planned route, nor whether the end product will tend more towards an LRT or a tram system. In fact, unless I’ve missed something, Marois and Lisée have been remarkably tight-lipped about the Tories’ bridge announcement but a week ago. But if the péquistes want to save face and show they’re not completely out of the Montreal transit-planning loop, they’ll have to develop something, and soon too. Or am I being too optimistic? This is Quebec after all. Perhaps I should be more concerned about the potential for a lot of toxic filth sitting at the bottom of the river getting mixed up into our primary source of drinking water. I suppose it’s just another reason we should build a tube-tunnel like the Lafontaine; sinking a tube into the water and atop the toxic sludge is probably the better option in this specific regard, but what do I know? Just another headache for the team that now has three fewer years to get the job done, and potentially one that, like so many others, will be ignored and passed down to future generations. If this LRT ever does get built, I can imagine it running from somewhere central in Brossard (Dix-30 gets thrown about a lot) to somewhere central in downtown Montreal, perhaps on University as part of a new ‘southern entrance’ to the city that will come the heels of the Bonaventure Expressway’s eventual replacement. But this is all pie in the sky for the moment. All that’s been agreed upon for the moment is that the Fed will design a new Champlain bridge with an LRT incorporated. The rest hasn’t yet been nailed down and I can only imagine the fashion by which the Tories’ have conducted themselves thus far may not make for the most productive of meetings with the province. There’s no debate whether we can get this done, it’s more a question of politics and political will. The PQ doesn’t like being told what to do or how things are going to roll, and it seems as though the Fed has perhaps even overstepped its bounds by treading rather forthrightly into areas of municipal and provincial jurisdiction. As it pertains to us, all that matters is whether this is a one-off project or whether this evolves into something that actually supports the transit needs of the citizens of Montreal. This is my chief concern, as it should be your own. If this LRT system is another boondoggle, a white elephant to add to the local herd, we might never get a significant improvement to our public transit system ever again. With low public morale comes a lack of political will. Superpoutre… guess we can all add that one to the lexicon. I have a feeling it may become quite common. For the uninitiated, the ‘Superpoutre‘ or superbeam (a 75-tonne steel reinforcement beam), was successfully installed on the Champlain Bridge over the weekend, meaning motorists are safe to continue risking their lives to get to Brossard. Mark my words, the Fed’s going to slowly reinforce the entire bridge with a steel exoskeleton until there’s basically a new bridge and the Champlain Bridge replacement project falls through completely (doubtless with many billions of dollars spent anyway). Suffice it to say I’m suspicious, nay, deeply cynical, of anything promised by the Tories, especially if, as they said yesterday, they’re planning on completing a new bridge three years earlier than initially anticipated. This, from the same party that hasn’t delivered a single warship, icebreaker, fighter or maritime helicopter, despite their many, nay constant, assertions that they’re being as expeditious and fiscally responsible as possible concerning those particular major acquisitions. The truth, the reality, is the exact opposite. They’ve squandered time and money without producing a single thing throughout most if not all their years in office. And now they want us to believe we’re getting a ten-lane bridge with an integrated light-rail system (and a toll) in four years? Or perhaps it’s more subtle than that… just a simple reminder of who’s boss, who gets things done. I can’t help but see this as anything but more political theatre. Maybe they’re not interested in winning in the suburbs (à la Toronto and Vancouver, and here too, albeit twenty-five years ago) as much as they might want to undermine local confidence in the main opposition parties and their leaders, both of whom represent urban Montreal ridings. Heck, if there’s nothing going a year from now, maybe we won’t have any faith left in government at all. That kind of disengagement can make any election a cinch for the incumbent. During Question Period today, when asked why there was no money set aside in the budget to actually pay the cost of construction, Infrastructure Minister Denis Lebel said that money was available, that he was aware, as he put it, that motorists were praying to god every time they crossed over and that the Federal government cared deeply about the safety of motorists etc. His announcement Sunday, equally calculated, included a provision for light rail that he had previously denied. The request for such a provision was a sticking point in negotiations between the Fed and the Marois government, which as recently as last Thursday was demanding that the entire bridge replacement project by transferred to the provincial government. Lebel returned that the Fed would be amenable to transferring control of Montreal’s bridges to the province after the new Champlain is completed. Mayor Denis Coderre was unenthusiastic, and I can only imagine Marois et al is upset they’ve been beaten to the punch and that a toll is part of the package regardless of their thoughts on the issue (someone’s gonna pay fer dat bridge). In any event, Lebel is also promising that the new bridge will have ‘architectural appeal’ despite axing the planned architectural design competition (which was apparently allocated about half the overall time for the project before the new schedule). Danish architect Poul Ove Jensen has been hired to oversee bridge construction, ARUP Canada will provide engineering services with Provencher Roy will provide architectural consultation. No bid, mind you. ARUP Canada Inc. was awarded a $15 million contract to provide these services back on October 28th. Lebel’s justification of the choice (or lack thereof) was that this particular group effectively provided the simplest, most cost-efficient solution. As to the choice of architect, well once again the federal government looks everywhere but our own backyard. Call me a patriot, I’d prefer our new bridge be designed by someone who actually lives here. As you’re no doubt aware, our city has bad luck when importing foreign design and construction methods. The Olympic Stadium, much like the Olympic Village, was designed for the climate of Southern France, not cold, snowy, windy, rainy ‘providing all seasons with gusto’ Montreal. The concrete used on both structures have both been negatively impacted by our winters, and this is saying nothing of the stadium’s ill-conceived roof. Similarly, the long concrete causeway that connects the steel portion of the bridge with Nun’s Island was built by a French company that also didn’t take into account local winter conditions – namely by not including a method to drain away accumulations of highly corrosive salted slush on the roadway. These modifications weren’t made until many decades after the bridge was built, by which point the damage had already been done. And why did this French company get the job? Because it had the lowest bid. Instead of using steel girders (like the recently-installed Superpoutre) they proposed an innovative (perhaps experimental) steel-cable reinforced concrete solution for the construction of the Champlain Bridge’s support structures. The concrete is so enmeshed with the high-tension cables it’s nearly impossible to fully replace existing beams, and so it looks like the only long-term solution to keep the bridge running until its replacement is complete is to do exactly what’s been done for many years already – 24/7 inspection and monitoring, patch-up jobs here and there, regular lane closures and occasional major repairs such as the one we just experienced. I’m anxious to find out some technical information about this new bridge, like what shape it will take, how it will span the Seaway and what materials will be used, but given the architect’s other designs you can expect something neutral, inoffensive though perhaps ill-suited for the aesthetic of the city. Consider that all our steel bridges seem to be holding up just fine (and have done so for many more years than the Champlain), and that the world’s best steelworkers live just across the Mercier Bridge in Kanawake. Isn’t it a bit odd we use so much drab, cheap, ineffective concrete in local construction when we have access to a superior material and internationally recognized workmanship? Incidentally, the Danish architect is well known for using reinforced concrete, not steel. In any event, to wrap this all up, I’m not convinced we’re going to get what we need in the end, and I’m unimpressed with the project so far. It seems like the Fed is making the same old mistakes – everything from not using a Canadian to design the bridge to not having an architectural contest of any duration to not having an open bid and apparently sticking with the absolute cheapest option. Oh yeah, and then there’s the expected re-use of a potentially flawed construction material. This isn’t a good way to start a rush job. And it seems to have only become a rush job for largely political purposes, which is worse still. Final note; we never even stopped to consider if we really needed a bridge at all. Tunnels, in most cases, can last far longer than bridges, and in our local case, could likely be built cheaper than a bridge using a proven technique utilizing prestressed concrete segments to create an immersed tube. So when you get right down to it, my question is still, fundamentally, this: why aren’t we building another Lafontaine Tunnel instead of a new Champlain Bridge? Conversely, a view from the bridge rather than of it. The most used bridge in all of Canada may be in danger of breaking apart and partially collapsing. Last week a known crack was determined to have widened enough emergency repairs and lane closures were merited. We’ve heard this before – it seems like the Champlain Bridge is in a constant state of emergency lane closures and repairs. As Bruno Bisson of La Presse points out, there’s no Plan B in case the bridge has to be permanently shut down in advance of any proposed replacement. And because there’s no inter-agency nor inter-governmental cooperation on major transit and transport issues in Greater Montreal, there’s also no real hope of creating a Plan B quickly. Ergo, if the bridge is in worse shape than we’re being told, it may become unusable and create one hell of a transit and traffic problem. One that will require swift corrective action less the closure of the bridge begin to negatively impact the city and region’s economy. Federal NDP leader Tom Mulcair describes the Tories’ handling of the Champlain Bridge replacement project as ‘inexcusable’ as the project is significantly behind schedule and is currently estimated to cost anywhere from three to five billion dollars. In addition, the poor state of the bridge has been known to the crown corporation in charge of it for some time, and a considerable sum of taxpayers’ money (federal money, not local or provincial just to be precise) has been spent applying band-aid solutions rather than building anything new. The Tories first proposed a bridge replacement project early in their first mandate – seven years ago. Nothing has been accomplished to date, though the estimated cost has increased considerably. Fifty million vehicles cross the Champlain Bridge each year, making it the single busiest crossing in all of Canada, working out to roughly 160,000 vehicles per day. Removing it from the city’s ‘transit and traffic equation’ without replacement would be very bad indeed, and not just for the individuals who cross it daily. The Champlain Bridge is bigger than itself, and if removed there will be a profoundly negative cascade effect presenting new stresses on every other bridge, tunnel and transit system used to cross the river. Though the bridge is only fifty-one years old and the youngest of the city’s four principle bridges, it was built with an apparently poor quality concrete that has eroded far quicker than expected. Transport Canada argues that the span was never intended to handle it’s current operating capacity and that de-icing salt, sprayed in the volumes necessary to clear the bridge for high-traffic use, has expedited the deterioration of the concrete. Today’s news is that a steel ‘super beam’ will be installed to buttress a girder against any further deterioration of its concrete. We should note that this beam was delivered in 2009; there are 350 beams on the bridge in various states of deterioration, and so I can imagine the Transport Canada may have several of these so-called ‘super beams’ lying around their worksites waiting to be used. Ergo, they’re anticipating years of serious maintenance and repairs anyways. A report issued by the Fed back in 2011 estimated that yearly maintenance of the deteriorating bridge (assumedly at constant current usage rates) would come out to a quarter billion dollars over the course of a decade without solving anything: the bridge will remain in poor shape without replacement, though assumedly the quarter-billion dollar investment would, at the very least, keep it going for a decade. Now Federal Transport Minister Denis Lebel is indicating the construction of the new bridge may be expedited to be completed before the originally estimated date of completion set at 2021. When was the last time the Tories got anything built and delivered on schedule? We have reason to doubt such pronouncements; not only are the Tories notoriously bad for over-promising and under-delivering, there’s no political advantage in speeding up construction. Does the cost of the new bridge (which, at $5 billion is ridiculously expensive) include the cost of maintaining the current bridge? It’s not like the question is ‘either we continue maintaining the bridge for an estimated quarter billion or we replace it for five’ – either both need to occur simultaneously or the current bridge is maintained up to the point it becomes redundant. Obviously, the current bridge can’t be shut down while the next one is being built. I’d like to know, were structural maintenance and repairs to be suspended, how long would it take before the bridge became unusable? How long before pieces begin to fall off? How long until it collapses? Assuming the bridge has a definitive expiry date, how much longer can Transport Canada and the Jacques Cartier and Champlain Bridge Corporation realistically and cost-effectively maintain it and how much is too much to spend, per year, on bridge maintenance and repairs? Would the bridge last longer/ cost less to maintain and repair each year if the traffic volume were reduced through the expansion of alternative transit systems? As to the cost of the new bridge, where exactly is the money coming from? There’s been talk of tolls used to pay down the cost once the bridge is completed. But does this mean that the federal government has three to five billion dollars up front to pay the cost of the bridge? It’s these last two points that brings us back to the issue of why we need a greater degree of inter-agency cooperation; if the Fed has five billion dollars to spend on a new bridge, why not invest that money in developing mass-transit systems that lessen the load on the Champlain? Reducing the bridge’s traffic volume may extend its life, or at the very least make it easier to repair and maintain. Even if the estimated cost to maintain and repair the Champlain Bridge for the next decade were to double to $500 million, this would be but a tenth the cost of the bridge’s apparent successor. Wouldn’t cutting one to two-thirds of the bridge’s daily vehicle crossings not only potentially extend the bridge’s lifespan but reduce yearly maintenance and repair costs as well? And if you could divert the rest of those vehicles onto other bridges without over-loading them, would we even still need a Champlain Bridge at all? And if those costs were reduced, wouldn’t that have an effect on the total cost of the bridge’s replacement, given that the proposed replacement wouldn’t need to be built as quickly, nor to the same, rather grandiose specifications as the current proposal? If the Tories want to do something that will actually benefit the people of Greater Montreal, then it stands to reason they should cooperate, fully, with provincial and local authorities to incite and propel a major shift towards public transit commuting throughout the South Shore. As it already stands, the AMT’s Candiac line is the fastest growing (in terms of usage) of the whole system, but both South Shore AMT lines combined carry less than half what the AMT’s Deux-Montagnes line carries by itself. In order to make the AMT’s South Shore lines more usable, they’ll need to increase operational tempo, and this in turn means working out a new agreement with the owner of the Victoria Bridge, which is to say Canadian National Railways. Further still, an entire new network of bus routes will have to be created to quickly pull in commuters from the sprawling suburbs to either the Longueuil Métro station or the many commuter rail stations operated by the AMT, though this is quite outside further incentives, such as rebates on transit passes. Constructing large parking lots and parking garages near bus and train hubs could help keep cars on the South Shore, but who would be responsible for such construction isn’t entirely clear. The major point is that the combined cost of maintaining the Champlain Bridge so that it doesn’t deteriorate quite as quickly, coupled with investments in public transit to lessen the bridge’s load, both come out to significantly less than building a ten-lane super bridge. Under ideal circumstances the Champlain would only be used by trucks, buses and people who cannot depend on public transit for their day-to-day work, with commuters dispersed across other modes. And if absolutely necessary, perhaps the Champlain Ice Bridge could be fitted with a temporary light-rail system to further encourage the shift away from car commuting. But all this requires, as I mentioned before, an entirely new way of looking at transit and transport issues, one that looks at the big picture rather than short-sighted notions of limited responsibility. As long as we’re dealing with an alphabet soup of transit agencies with competing political interests we gain nothing; as long as we wait for the Fed to replace the bridge we get nothing but a lot of cheap talk. If our newly elected mayor is looking for something to do, I suggest he meet with the mayor of Longueuil, the heads of the RTL, AMT and STM and see what short-term measures they could put into place to turn down vehicular volume on the Champlain Bridge, and as quickly as possible too.